To continue our funeral home advertising series for 2019, let’s talk about Facebook advertising. The world’s largest social network is a brilliant tool that allows you to target, reach and engage with the community you serve. In years past, this may have been a tough sell for some death care businesses. But now, it is proven to be the single most effective (and affordable) advertising option for most funeral homes. Why? It’s where many people spend a good portion of their daily screen time. Also, Facebook’s ads allow you to send specific messages, to specific audiences and connect with people in a more personal way than other advertising platforms. The possibilities are bountiful. Although funeral home social media marketing is a broader topic that includes both organic and paid advertising, this will be strictly about the latter. In this post, I will provide an overview of why Facebook advertising is the right choice for your funeral home. In addition, my goal is to help you understand the benefits of paid social media advertising when compared to other forms of marketing and paid advertising. One of the aversions funeral professionals have had for Facebook, and social media, in general, is based on the false perception of an exclusively millennial audience. As it turns out, more than just young people use Facebook regularly. In fact, according to Hootsuite, 68% of all Americans were Facebook users in 2018. Notably included in that figure is one particular demographic that every funeral home should care about; the elderly. 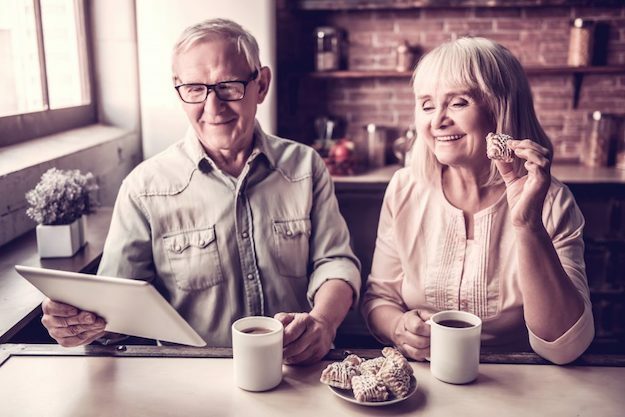 Over the last 5 years, the number of Facebook users aged 65 or older has doubled. Meaning that all generations within a given community are now available to be reached on the platform. One of the best things about Facebook advertising is flexibility. There is a litany of both on-page and off-page options that allow you to promote how you want. In simple terms, you can place ads throughout people’s Facebook experience; on their home feed, on the side of the page and more. No matter what you want to accomplish, the platform can help. 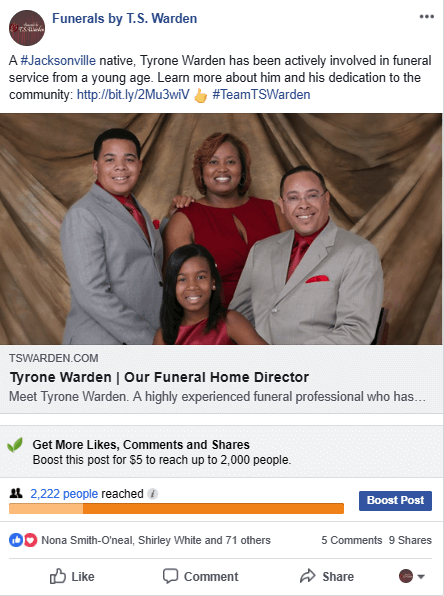 The best place to start is with on-page boosting which is a basic but powerful Facebook Advertising option for funeral homes. This is a button you can hit anytime you go to post something to your page. For example, if you want to showcase your staff page, get more eyes on your cremation services page or generally bring more people to your site, you can promote for link clicks. Similarly, if you want people to engage (like and comment or share) with an anniversary post or a contest then you can promote for engagement. You can even promote your posts to receive direct messages from potential customers. The best part is, this can be a very inexpensive way to advertise your business. We’re talking as little as 5-10 dollars a day. How does it work? Really you just select the post you want to “boost”, set your goal and choose how much you want to spend and then simply press play. Generally the more budget you place towards an ad the better it will perform. However, Facebook ad performance also depends on the quality of the ad text, image, and relevancy of the landing page. Then all you have to do is monitor your posts, see how they are doing and look for ways to improve. There are many other types of Facebook ads to try, but starting with boosted posts is easy, quick and won’t bend your budget. You may even find it to be fun. Below we share some examples of Facebook ads that we have created for two of our clients. 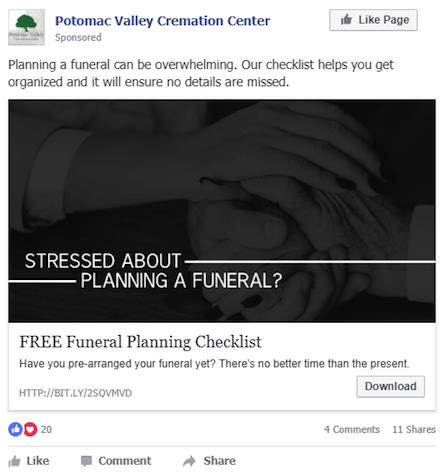 The one ad for Potomac Valley Cremation Center sends people to a landing page where they can download a funeral planning checklist. The other for Funerals By T.S. Warden sends people to a page on the funeral home website’s that talks about its funeral director. Each of the ads uses quality images and enticing text. Traditional channels like billboards, church bulletins, newspapers, radio and TV advertising for funeral homes have long been trusted sources for generating new business. However, these mediums are more for broadcasting and are generally unfocused. The difference is really what you get for your money. With Facebook advertising specifically, the targeting tools and algorithms are so precise. While it is still not pay-per-result, like Google advertising, great return is easier to achieve than the traditional channels mentioned above. Instead of paying to be potentially seen by all of the 40,000 people that travel on a certain road every day, you are paying to probably be seen by the 3500 women in your area who are over the age of 55 and interested in scrapbooking. The affordability of Facebook advertising for funeral homes is founded in this microscopic profiling. In addition, it gives you more opportunity to play with the message of your ads. Instead of having to invest in one, general advertising message, you can try several different versions, crafted for specific audiences. For example, the audience of creative 55+ women would react differently to pre-planning selling points than working men under 40. The power of Facebook is that you can connect with anyone. After all, that’s how the platform got its start before it became a massive advertising tool. Want More On Funeral Home Facebook Advertising? Some firms have not even created profiles on social media. Let alone started advertising. We get it. Or maybe there is not enough time or you have previously thought that there is not enough budget for Facebook ads for your funeral home. Perhaps you have started playing around and want to take it to the next level. No matter what your experience with social media, we would be happy to help you get more from your funeral home’s social media marketing. Feel free to reach out any time you want and get in touch with our team. Also, if you want to know more about funeral home advertising check out our previous posts in this series about 2019 trends and Google Ads for funeral homes.